As we covered in our review of the best AP US History textbooks, The American Pageant is far and away the most popular APUSH textbook. Not only does it include all the material you must know for the AP US History exam, but it also has lots of helpful tools, including timelines at the end of chapters to help you get down dates and primary sources to help you prepare for the Document-Based Question (DBQ). "Onto this stage stepped Christopher Columbus. This skilled Italian seafarer persuaded the Spanish monarchs to outfit him with three tiny but seaworthy ships, manned by a motley crew. Daringly, he unfurled the sails of his cockleshell craft and headed westward. His superstitious sailors, fearful of venturing in the oceanic unknown, grew increasingly mutinous. After six weeks at sea, failure loomed when, on October 12, 1492, the crew sighted an island in the Bahamas. A new world thus swam within the vision of Europeans." This definitely sounds like a novel! "Eager to capitalize on the new technology and knowledge, Christopher Columbus, an ambitious sailor from the Italian port city of Genoa, approached John II of Portugal in 1484 and asked him to support a voyage westward from Portugal, to the East Indies. The king refused when his geographers warned that Columbus had underestimated the distance. Undeterred, Columbus peddled his idea to various European governments over the next several years but found no one willing to take the risk. Finally, in 1492, Ferdinand and Isabella's defeat of the Moors provided Columbus with an opportunity." 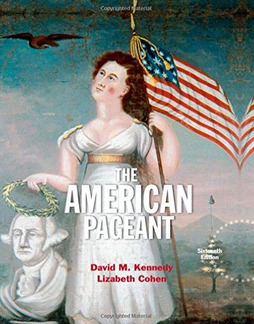 Pageant is also a favorite of many teachers of the AP US History class (the textbook is mentioned on tons of blogs and reviews from AP US History teachers). So if you’re without a textbook for AP US History, you’re a teacher shopping around for materials with which to teach your class, or you just want some extra study material, this is the best APUSH textbook to get. You can rent the latest edition of Pageant for around $30 on Amazon. But here's another tip: you can usually buy used older editions for a lot less. Since this book doesn’t change dramatically between editions, buying a used older edition of it is a great way to get a super cheap and useful textbook for your AP US History studies. 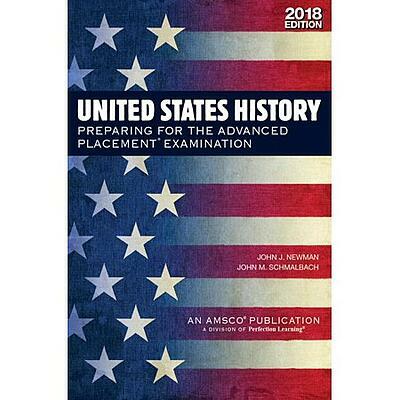 This book has clean, concise, readable summaries of key AP US history points and events to help jog your memory and review what you need to know for the exam. 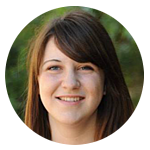 The summaries are quick and to-the-point, so you don't have to slog through tons of pages. This book also contains end-of-chapter review questions to help you retain information as you move through it. 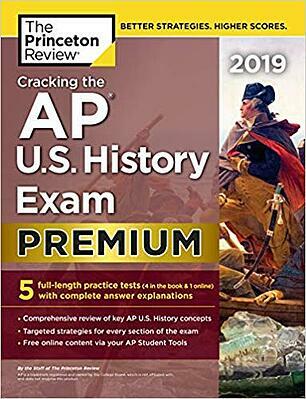 Not only does Cracking the AP US History Exam cover all the historical information for the APUSH exam, but it also spends ample time explaining the exam essays, including the tricky document-based question. So basically, the book preps you for the AP US History exam's material and helps you get ready for the exam itself. Cracking the AP US History Exam also offers many helpful strategies for tackling multiple-choice questions and clearly explains how many raw points you should aim for to pass the test (get at least a 3) or ace it (get a 5), depending on your goal. This info is extremely useful in helping you develop a strategy for the AP US History exam. Finally, the book provides you with access to the online AP Student Tools portal for more practice, study plans, and up-to-the-minute information about the test. If you’re not a big fan of The Princeton Review’s angle or if you just want another prep book, here's a brief overview of some other quality APUSH books on the market and their pros and cons. Based on your study needs, you can pick out the best prep book (or books!) for you. 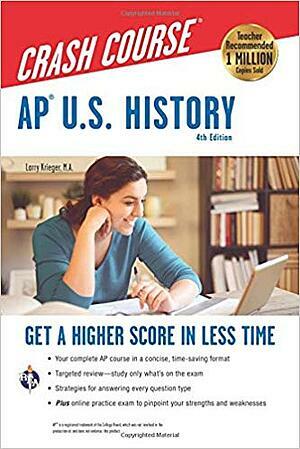 Kaplan's latest AP US History book gives you tons of practice, thanks to the three full practice tests it includes. 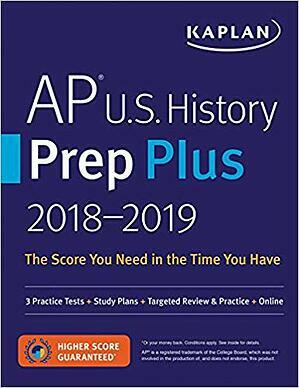 The practice tests reflect the recent AP US History redesign, unlike some past popular favorites which had been criticized for not accurately updating their practice tests (for example, the books 5 Steps to a 5 and Crash Course ). However, some students worry that many of Kaplan's APUSH practice tests are too easy, with direct questions about the date of events, or DBQs focused mainly on cartoons/images rather than written sources. In addition, the book lacks answer explanations to the multiple-choice questions in the practice tests, making it difficult to determine where you went wrong. Verdict: This is a great book for extra exam practice, but it's not the best source for a clean and accurate US history summary. While this shouldn't be your main AP US History review book, you can definitely use it as a supplementary resource in your prep. AP US History Crash Course is the fastest read in terms of APUSH books, so it's probably the best choice if you’re in a pinch! Crash Course is known for being very clear and concise. The drawback here is that there's only one practice test, meaning both The Princeton Review and Kaplan give you better bang for your buck in terms of test practice. Verdict: This is a great book for a quick review of AP US History topics and strategies, but it's not a great book if you want lots of practice. If you have a teacher who gives tons of practice exams and all you need is a brief review of the material on the APUSH test, this is a good book for you. 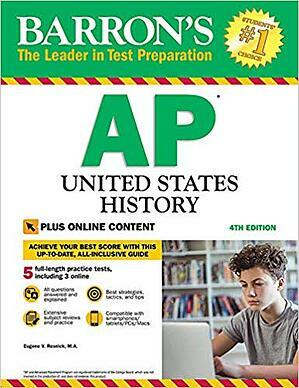 AMSCO's AP US History book has decent reviews and well-written chapter tests that are similar to the actual AP test; however, it only comes with one full practice test at the end of the book, so it might not be the best deal out there. The biggest drawback is that for some reason the student edition of this AP US History book doesn’t automatically come with an answer key. It's also apparently hard to order an answer key for the practice questions. Only teachers can order the answer keys, so if you want them you will have to find a way to ship them to your school. Verdict: Since practice tests are only useful tools when you can review the answers, unless you want to go out of your way to order this book and the answer key, we suggest one of the other prep books on this list to save yourself the trouble. 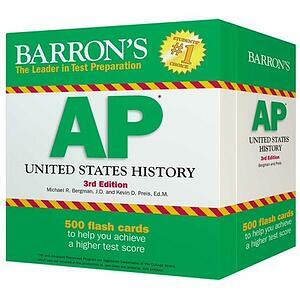 Think of Barron's as the jack-of-all-trades, master-of-none: it has a decent summary of the AP US History test and five full-length practice tests (two in the book, three online); that said, it's not as snappy and readable as The Princeton Review and it's not as concise as Crash Course. This might be your best bet if you want a second prep book or if you're looking for access to lots of AP practice tests, but it probably shouldn’t be your first choice. Verdict: You should buy a prep book with a clear goal in mind: either for all-around review and practice (Princeton Review), fast and efficient AP review (Crash Course), or tons of practice tests (Barron's). Just looking for multiple-choice practice and lots of it? 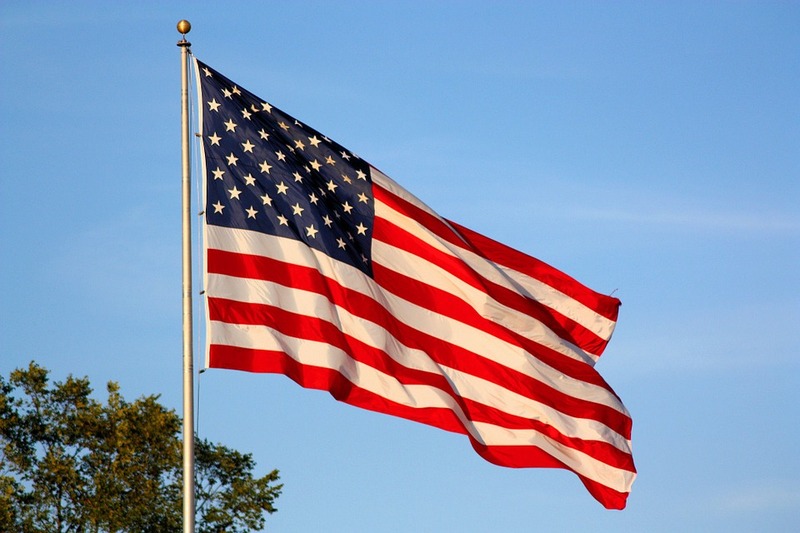 Our AP US History exam guide offers a compilation of the best AP US History quizzes, gathered from textbooks' websites and other free resources. Altogether, we've found hundreds of quizzes you can take to learn more about each major era of US History. This is a great way to review parts of US History you don’t remember that well or to get an overall review for the AP US History Test. The drawback here is that these questions are not AP multiple-choice; they are multiple-choice questions from various textbooks and websites, so the style is somewhat different. In addition, many of these quizzes are focused on just one era of US history, so you don’t get the wide range of questions you'll see on the actual AP exam. Still, these quizzes will help you master specific eras of US history for the actual AP test. I highly recommend checking them out! Barron's AP US History flash card set is a great way to review key facts, dates, and figures for the AP exam. Flash cards are an excellent learning tool, and these will save you the hours it would take you to make your own. This set gives you 500 cards that quiz you on everything, from the exploration period to present day. These cards are divided into seven general categories: Arts and Sciences, Domestic Policies, Presidential Matters, Wars and Foreign Relations, Economy and Business, Legal Issues, and Society and Culture. All cards are numbered and labeled, so you can quiz yourself by time period or category, which will help you focus your studying. They even come with a metal ring so you can choose which cards to take with you and study. These are a great choice if you want to be able to study on the go! The only downside is that there's quite a bit of information on each card, so some people might find that they're more like informational cards than they are true flash cards. AP Study Notes has detailed notes on every era of US history, taken from The American Pageant—and it’s completely free! This is a great resource if you want to brush up on a particular era of US history before the AP test in May. Our blog can also help you prepare for any in-class AP US History tests. You can get a detailed breakdown of each era in our AP US History study notes article. There are lots of potential resources you can use to study for the AP US History exam, including textbooks, prep books, flash cards, websites, and more. Don’t feel as though you have to use them all to get a high score, though. On the contrary, you should find a resource or two you find particularly helpful and use it consistently. As long as you pace yourself and give yourself plenty of time to study and practice, you'll be more than prepared when you sit for the AP US History exam in May! Get more information about the AP program—what the hardest and easiest classes are, when the exams are this year, and whether taking AP classes is worth it. Taking AP US History this year? We also suggest you take the SAT Subject Test in US History if you’re applying to colleges that require/highly recommend SAT Subject Tests. You can read more about SAT Subject Tests, and why you should take them, right here. Also studying for the SAT/ACT? Learn the best time in your high school career to take the SAT/ACT for the first time, and get tips on how long you should study for the SAT/ACT.